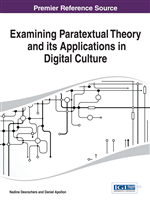 This chapter considers how one may use Genette's concepts of paratext and hypertext within transmedia narratives and born-digital texts and explores how Web publication problematizes standard ideas of authorship and copyright. This challenges our concepts of originality and our understanding of what constitutes the text and what stands outside it. This chapter explores Nick Montfort's “Taroko Gorge,” a born-digital poem, and Jasper Fforde's “The Eyre Affair,” analyzed as a transmedia narrative, within the framework of Genette's theories of “paratext” and “hypertext.” This chapter highlights the difficulty of reconciling the intellectual and political necessity of a world in which data is freely shared with the practical concern of how the producers of creative work can make a living.